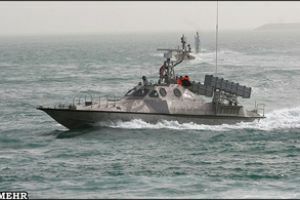 The U.S. Navy has determined that Iran has amassed a fleet of fast patrol boats in the 43-kilometer straits. Iran's Islamic Revolutionary Guard Corps, responsible for strategic programs, leads the effort. "This marks the implementation of Iran's swarm program, where dozens of armed speed boats attack much larger naval vessels from all sides," an official said. IRGC swarming tactics envision a group of more than 100 speedboats attacking a target, such as a Western naval vessel or a commercial oil tanker. They said 20 or more speedboats would strike from each direction, making defense extremely difficult. Wait, they won't just magically appear all around a carrier battle group all at once? 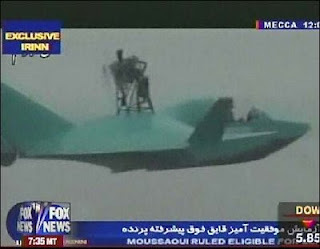 Even with their incredible Iranian stealth attack ground effect boat/planes? Swarming tactics are not new; they have been practiced by land armies for thousands of years. Such tactics require light, mobile forces with substantial striking power, capable of rapidly concentrating to attack an enemy from multiple directions and then rapidly dispersing. Iranian naval swarming tactics focus on surprising and isolating the enemy’s forces and preventing their reinforcement or resupply, thereby shattering the enemy’s morale and will to fight. Iran has practiced both mass and dispersed swarming tactics. The former employs mass formations of hundreds of lightly armed and agile small boats that set off from different bases, then converge from different directions to attack a target or group of targets. The latter uses a small number of highly agile missile or torpedo attack craft that set off on their own, from geographically dispersed and concealed locations, and then converge to attack a single target or set of targets (such as a tanker convoy). The dispersed swarming tactic is much more difficult to detect and repel because the attacker never operates in mass formations. During the Iran-Iraq War, the Pasdaran navy used mass swarming tactics; as a result, its forces proved vulnerable to attack by U.S. naval and air power. Because of this, it is unlikely that such tactics would be used for anything but diversionary attacks in the future. In today’s Iranian naval forces, mass swarming tactics have largely given way to dispersed swarming. Dispersed swarming tactics are most successful when attackers can elude detection through concealment and mobility, employ stand-off firepower, and use superior situational awareness (intelligence), enabling them to find and engage the enemy first. This accounts for a number of trends in Iranian naval force development in the past two decades. The first is the acquisition and development of small, fast weapons platforms—particularly lightly armed small boats and missile-armed fast-attack craft; extended- and long-range shore- and sea-based antiship missiles; midget and diesel attack submarines (for intelligence gathering, covert mine laying, naval special warfare, and conventional combat operations); low-signature reconnaissance and combat unmanned aerial vehicles (UAVs); and the adaptation of the Shahab-3 medium-range surface-to-surface missile armed with a cluster warhead reportedly carrying 1,400 bomblets, for use against enemy naval bases and carrier battle groups. Iran has also sought to improve its ability to achieve surprise by employing low-observable technologies (such as radar-absorbent paints), strict communications discipline, stringent emissions control measures, passively or autonomously guided weapons systems (such as the Kowsar series of television-guided antiship missiles), and sophisticated command-and-control arrangements. To support its naval swarm tactics, Iran has encouraged decentralized decisionmaking and initiative, as well as autonomy and self-sufficiency among naval combat elements. Dispersed swarming? Adm Cosgrove has it right - a coordinated attack is difficult to conceal and an uncoordinated attack can lead to forces being defeated seriatim. For some thoughts on the effectiveness of other "super" weapons, Galrahn has a good post here. Iranian Boghammer from "Operation Earnst Will." Note on the bow the box is 107mm rocket launchers and also carried 51 cal on stern, plus RPGs & SAAM missles. 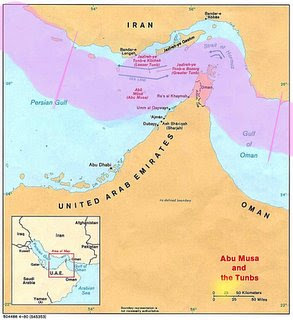 UPDATE: Map of Strait of Hormuz liberated from someplace else. It purports to show Silkworm missile ranges in the area. To reiterate, it's really hard to hide 20 or 30 or 100 boats getting underway and trying to sneak around in an area like the Persian/Arabian Gulf. Faster boats don't add much to the picture - except they make faster fireballs flaming across the water. However, there is some interesting discussion of "swarming tactics" at the Canadian Naval Review that points out a few successes in special circumstances (HMS Cornwall was in a maneuver bind when the IRGC went after her small boat crews, for example, or the famous "victory" by a swarm brought by a U.S. Marine general in a training exercise). By the way, "victories" like that are why we do training exercises in the first place. The Iranians used small speedboats extensively within the Gulf and the Strait throughout the 1980s Tanker War with Iraq, inflicting damage on vessels with rocket-propelled grenades (RPG) and machine guns. During the War, Iran often used the boats in shallower, coastal waters, where the boats could swiftly attack and then hide among the "multitude of islands, islets and coral reefs." Iran also used small boats to lay mines with a small, crude onboard crane. ANOTHER UPDATE: Phil Ewing of the Navy Times "The Scoop Deck" captures the essence of the Iranian claims with his posts Iran’s massive armada ("That means that Iran has the largest navy in history by an enormous margin — so many combat vessels that you could walk their decks from Bandar Abbas to Doha without getting your feet wet.") and Swarm Warning ("Action movie directors are encouraged to make a summer blockbuster that includes Marine Corps AH-1W Super Cobras defending a Navy strike group against a small-boat swarm attack. Because that would be epic."). However, if Hollywood needs script advice and a handsome old guy to play the tough but kindly American admiral . . . my email address is over on the right. "Picture of captured Iranian Boghammer boat in San Diego Harbor..."
Not captured, salvaged. Sunk along with 2 smaller boats south of Farsi Isl in the NPG Oct 87 by "little birds" off the Mobile Sea Bases. "This susceptibility may be one of the major factors causing the IRGC to retreat from a planned attack on Kuwaiti oil infrastructure in October 1987 in the face of a Saudi/U.S. show of air and sea strength"
What backdown? 2 tankers were hit - 1 US flaged, just under 2 miles from the Sea Isle Terminal. We retaliated against the Rostam platform. They finally hit the Sea Isle Terminal 2 weeks later. They were targeting the terminal the entire time. No, no, not Cobras...MH-60S Armed Helos! Knighthawks forever. Come on Eagle1, you especially know better than to doubt the HSC Bubbas. Actually, BJ, I was assuming all the MH-60S will be busy with the exciting world of AMCM . . .